A skeleton made of gold. Encountered only by the truly lucky. Made of dazzlingly brilliant gold bones. 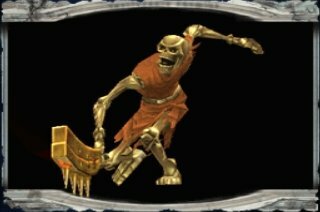 Golden Bones has a .00000005% chance of appearing to adventurers in the company of other skeletons. Some interpret this to mean that Golden Bones is an elitist or antisocial; the fact of the matter is that Golden Bones is afraid that he will be disassembled by poachers and that his parts will be sold on the black market. He is also quite busy for a skeleton, and has been hard at work composing the longest piece of xylophone jazz for at least 300 years. Golden Bones was killed once by an adventurer known as the Frontflip Master. Frontflip Master's adventuring log claims that this feat took 46 hours and 35,429 hits to perform. If these numbers are accurate, Golden Bones might have the most life force of any creature in the universe (his fighting ability, however, could be the inverse). Fortunately for Golden Bones, Frontflip Master was world-record dumb and simply left after Golden Bones fell apart, assumedly to do more frontflips. Golden Bones reassembled soon after through the sheer glamorous power of his bones' luster. Long ago, Golden Bones was impregnated by some dark ether from Dark Mals, and will sometime in the future give birth to Miracle Egg. Some scientists say that if Miracle Egg hatches, G-Urth's center of gravity will shift to be Golden Bones, all living creatures' bodies will turn inside-out, and the passage of time will speed up x1000. Other scientists say that skeletons can't get pregnant, and have no idea how anyone could tell that a skeleton was pregnant if skeletons could get pregnant. Golden Bones' bones are golden and made of gold. Also gold.